(April 13, 2018) -- The University of Texas at San Antonio (UTSA) Office of Undergraduate Admissions and Scholarships Office will recognize outstanding UTSA scholars for exceptional academic achievements. 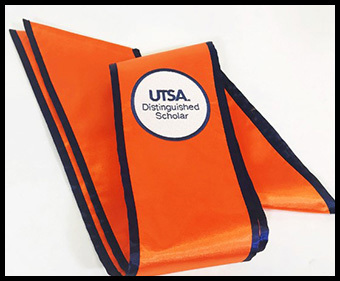 The Distinguished Presidential Scholars and Distinguished Transfer Scholars will be honored during a stole ceremony from 6 to 8 p.m. on Monday, April 16 in the Student Union Retama Auditorium (SU 2.02.02). The Distinguished Presidential Scholarship is a competitive scholarship awarded on a sliding scale to incoming freshmen to recognize students’ academic achievements in high school. The scholarship is available for up to four years. The Distinguished Transfer Scholarship is a competitive scholarship awarded to incoming transfer students who transfer in between 24-66 hours and a 3.75 GPA or higher. The scholarship is available for up to two years. Both scholarships, which are contingent on funding, require students to maintain a rigorous degree of academic merit while attending UTSA to maintain full or partial eligibility. Students attending the stole ceremony have successfully completed their respective scholarship cycles and are graduating as Distinguished Scholars of UTSA. They will wear their stoles with their academic regalia at Spring Commencement, highlighting their unique accomplishments. Learn more about UTSA scholarship opportunities. Learn more about UTSA Commencement.